Ways to define your marketing target. Answer each one to make your marketing target more actionable and competitive, so you can win. Broad targets like these put your business or brand in a weak competitive position. It’s a mistake to assume that these broad groups are homogenous. Doing so makes your brand, products and communications less relevant. In today’s economy, more and more companies are servicing ever more specific groups of customers. In many cases, the sharper you can make your target, the better. Mid- to upper-income 30-60 year olds who are motivated to save. They’re married, with kids and a house. They feel good, even proud, doing things that save money—like do-it-yourself (DIY) projects. They file their own taxes because they believe it’s relatively simple and saves accounting fees. But they’re unaware that they’re missing out on additional tax credits and deductions that could save them even more. Now that’s a target audience you can effectively act on. 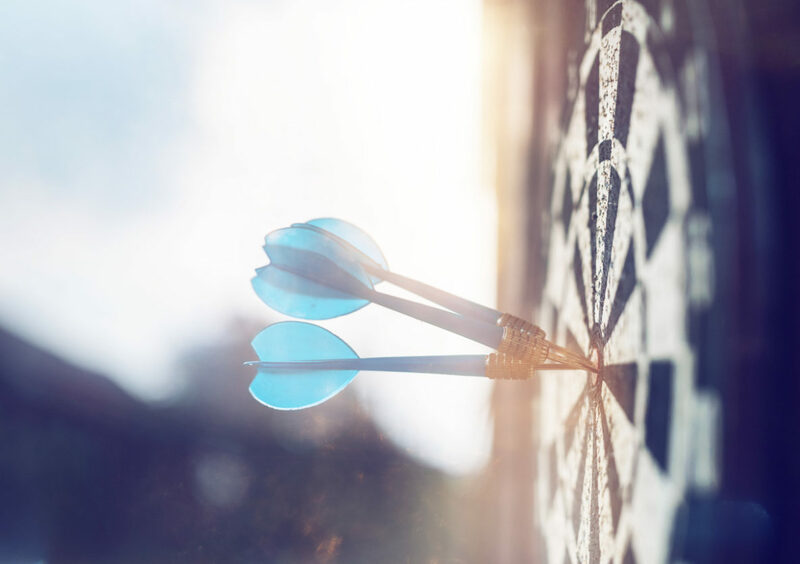 Notice that the above marketing target is specific enough that you can picture who the person is, with enough detail that you know what’s most relevant to the customer. It’s also clear what problem the brand should solve. To help you sharpen your marketing target, here are seven key characteristics to consider. If you can define each of them, you’ll be better positioned to find and serve your high-potential customers. You’ll also better insulate your business from competitors. This first characteristic applies for B2B companies. There’s a movement towards increased specialization and niche over time. This trend continues because business customers want to buy products and services from companies that know the nuances of their specific industry (a.k.a. vertical). Examples include automotive, healthcare, power, aviation, consumer goods, foodservice, etc. Forcing yourself to think about and choose an industry allows you to tailor your message, products and services. As a result, the tailored approach leads to higher provided value and better competitive resistance. Does your current customer base already reflect a good fit with a particular industry? Is there a secondary industry where your products/services/methods could easily apply? Demographics are statistical data related to groups within a population, often based on tangible traits (physical or socioeconomic characteristics). Since they are widely used, you are likely already familiar with them. Examples include age, gender, income, nationality, ethnicity, religion, etc. These are usually the first targeting characteristics that brands utilize. That’s because they are 1) relatively easy to obtain via third party data and 2) the primary way that brands purchase media inventory. Psychographics involve the classification of people according to mental beliefs, personality, mindset, and other psychological criteria (not physical or socioeconomic). They describe the key motivations and priorities of the target. Examples include attitudes, opinions, values, aspirations and motivations. They can be initially uncovered in qualitative research, and then measured in custom quantitative research. Think of psychographics as the mental lens through which your target audience views the world. What does your target audience think? Do they have opinions? What motivates them to act? What are their priorities? Attitudes are a type of psychographic characteristic. But I’m calling them out separately because marketers so commonly use them. An attitude is a way of thinking or feeling about something (perspective or stance). When used in marketing, they are sometimes expressed as beliefs about, or disposition towards, a particular subject matter. Attitudes are commonly measured in Usage & Attitudes studies. Segmentation studies commonly use attitudes to cluster segments. A behavior is the way in which a person acts—usually non-verbal for marketing purposes. Usage behaviors are category or purchase behaviors. Telling behaviors are tip-offs that identify a prime target (may not be category related). Needs are customer/consumer requirements, wants or desires. They can be functional or emotional, articulated or unarticulated, met or unmet. Examples include softer bath tissue, long-lasting battery power, enamel repair, safety, pleasure, fun, pride, etc. When researching needs, brand marketers often look for two very important measures: relevance and met/unmet. Answering a relevant yet unmet need can give you a powerful and differentiated advantage in the market. Issues, tensions and barriers stand between the customer/consumer and their desired experience. Consider category problems, life problems and emotional problems. Examples include bland-tasting food, car breakdowns, the bank isn’t open, dry skin, embarrassment, sadness, doubt, etc. What stands in their way? What are they experiencing that bothers them? 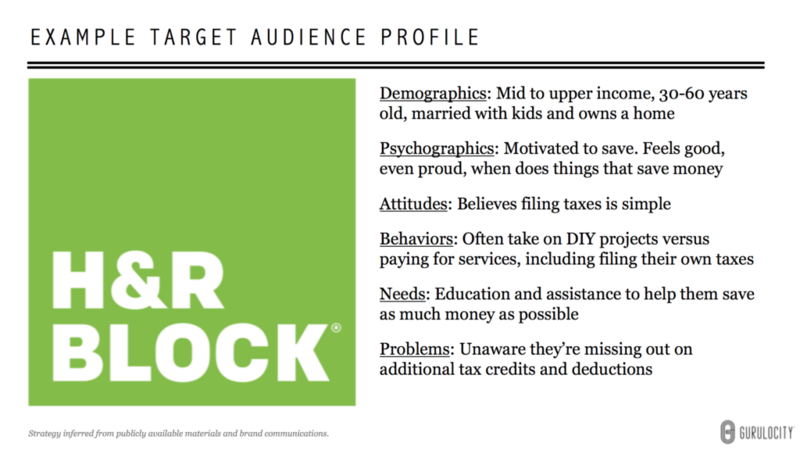 To see how all of the pieces come together, take a look at the following inferred example for H&R Block tax services. It illustrates how having a simple answer for each of the above criteria can paint a clear picture of the target audience. Very good. Informative and helpful in everyday information gathering with the customer base.